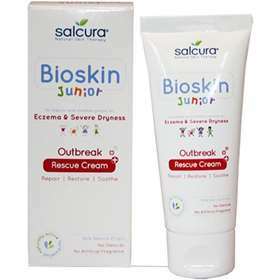 Salcura Bioskin Junior Outbreak Rescue Cream 50ml A gentle formulation for easing flare-ups in babies and children prone to eczema and a high degree of skin dryness. A highly effective and safe and easy to use therapy to repair, restore and soothe. The Salcura natural skin therapy range. Rescue cream for eczema and severe dryness. Suitable for both babies and children. Quickly calms outbreaks to skin. Aqua, Glycerin, Linum Usitatissimum (LInseed Seed Oil), Urea, Cetearyl Alcohol, Olea Europea (Olive Fruit Oil), Zeolite (Minerals), Cetearyl Gluciside, Borago Officinalis (Borage Leaf Extract), Olea Europea (Olive Leaf Extract), Ricinus Communis (Castor Seed Oil), Simmondsia Chenensis (Jojoba Seed Oil), Phenoxethanol, Sodium Cetearyl Sulfate, Ethylhexylglycerin, Caprylyl Glycol, Echium Plantagineum (Echium Seed Oil), Cymbopogon Martini (Palmarosa Oil), Lavendula Angustifolia (Lavender Oil), Perlagonium Graveoleris (Rose Geranium Oil), Rosa Demascena (Rose Flower Water), Citronellol, Geraniol, Phenethyl Alcohol, Linalool.